Have you ever used up the blank Blu-ray discs? Don't you think it is a waste to buy expersive Blu-ray discs? When you donwload some Blu-ray ISO, do you know how to take full use of your ISO files? How to make your Blu-ray ISO playable on any devices? Converting Blu-ray ISO to 1080p MKV could be a good choice. Well, in this post you will find a good way to utilize your ISO files, can't wait? Here we go. As we all know, Blu-ray ISO file (also known as ISO image file) is actually an "image" of entire DVD or Blu-ray Disc, which are not supported by most tablets. To watch Blu-ray ISO files on your tablets, smartphones, TVs, game console, you will need to rip/convert Blu-ray ISO to most devices accepted format such as common 1080p MKV, H.264 MP4, AVI, WMV etc video format. Here we strongly recommend you Pavtube ByteCopy, which can convert Blu-ray ISO to massive formats like, MOV, MP4, MKV, WMV, AVI and more for your iPad, iPhone X, Samsung Galaxy tabs or other devices. Furthermore, this program has the ability to bypass copy and region protection on a commercial Blu-ray disc. In addition, as the Blu-ray disc encryption frequently changes and becomes harder to crack, so you'll need to get this program that can bypass this encryption and download updates so it can break the most recent encryption. Note: Pavtube ByteCopy has upgraded to v4.9.2, add support for Blu-ray AACS MKB v63. 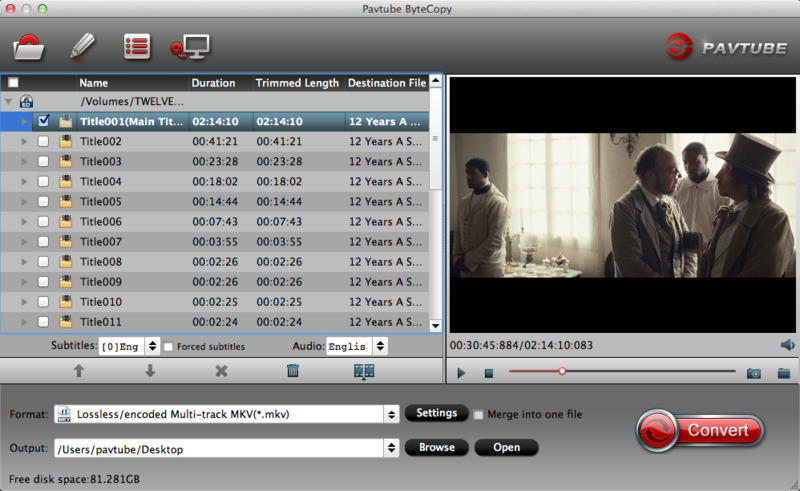 Pavtube ByteCopy also works as a useful video editor. With it, you can trim to cut Blu-ray ISO movie opening and ending, moreover, you can add external subtitle to your Blu-ray ISO movies, or extract subtitle from it, by the way , you also can remove subtitles with this smart assistant. For those people who want to save more storage space for playing games with this tablet, this program allow you to customzie video parameters to get smaller video size. More features in this guide for you. Below, we will go with Mac version to show you how to convert Blu-ray ISO file to 1080p MKV for playback. Its Windows version has the same operating procedures. Launch the program on your computer, click "File" drop-down list, select "Load IFO/ISO" to add Blu-ray ISO image files. This program supports you to input DVDs, DVD/Blu-ray folder, DVD IFO/ISO file, Blu-ray discs and common video to it. Click "Format" drop-down bar, select "MKV HD Video" from "HD Video" main menu. If you have other needs, Samsung, Apple, TVs, Game console, even other hundreds of optimized device presets are waiting for you to choose. Moreover, apart from 1080p MKV video, you are able to select "Multi-track MKV" to keep multi-audio tracks, subtitles streams, chapter markers. Multi-audio track MP4, MOV are also availabe here. Step 3: Adjust profile settings. 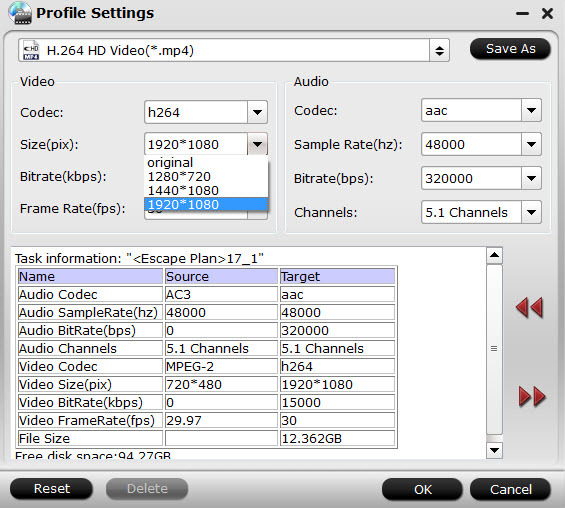 Click the "Settings" icon and you can adjust codec, bit rate, frame rate, sample rate and audio channel in the interface according to your needs and optimize the output file quality. To output 1080p MKV, you need to change size to 1920*1080. Note: video size is based more on bit rate than pix. Go back to the main interface, hit the right-bottom "Convert" button to start Blu-ray ISO to 1080p MKV on Mac. When the conversion is completed, you will get no problem to transfer and watch Blu-ray ISO movies on any devices.